The app gets a new set of features as well. Earlier this year, Eero launched a home WiFi solution that it claimed would solve all our wireless woes. 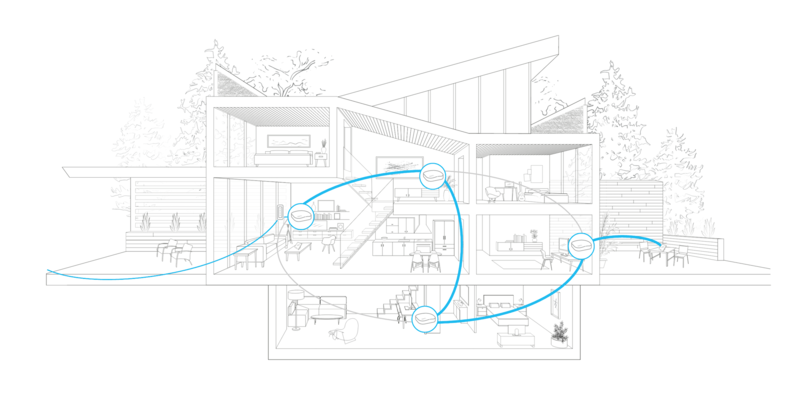 The idea behind Eero's system is simple; instead of relying on one router to connect your whole house, it uses multiple hubs. Each Eero hub combines the functions of a wireless router, a range extender and a repeater, and you can easily connect them to one another with a companion app. The whole system is essentially a wireless mesh network for the home. Months later, and Eero is unveiling a massive update that not only brings faster and better performance, but also Amazon Alexa compatibility and a slew of new app features. The update will roll out to users starting this week. That performance boost comes from a technology that Eero is calling TrueMesh. It's a brand new mesh architecture that the team redesigned from the ground up. CEO and co-founder Nick Weaver tells me that this was in large part based on the data that it's received from its customers throughout the year. "What this has allowed us to do, is to max out the hardware that people have," he said, adding that this will result in up to 40 percent speed improvement. He was careful to note that this speed boost is in your local area network only; your actual internet speed is of course still dependent on what you get from your ISP. Still, this is a pretty big step forward. "A pretty huge amount of engineering went into it," he said. In addition to speed, the firmware update will also make it significantly more resilient to connection issues. "If there's a device that's hogging a lot of bandwidth and causing a lot of interference, it'll reroute traffic through the network in a much more reliable clip." In essence, TrueMesh promises dynamic rerouting and the ability to adapt to network demand on the fly. Oh, and the tech also allows Eero to be a lot more expandable, so feel free to tack on more Eeros if you live in a particularly spacious abode. The next big feature is the compatibility with Alexa, Amazon's digital assistant. Interestingly, Weaver tells me that one out of five Eero customers already have an Amazon Echo in their home, so this feature will likely get some use. One of the things you can do with it is to pause device profiles, which you can set up for each family member. So when it's time for dinner, for example, you can say "Alexa, ask eero to pause all profiles," which would then cut off the internet for all connected devices, forcing your family members to come to the table. You can also pause a certain individual's profile, which might be useful if someone's playing a game instead of doing his or her homework. A particularly useful Alexa feature is that you can ask Eero to help you find a missing device. If you've lost your iPhone, for example, you can say "Alexa, ask Eero where my iPhone is." It'll then tell you which Eero hub is currently connected to it so you know where to start your hunt. You can also ask Alexa to turn off the LED of your Eero, so it doesn't glow in your bedroom when you're trying to sleep. Last but not least, the Eero app is also getting more functionality. For one thing, you'll get much more information about the connected devices. You'll be able to see which Eeros each device is connected to, what's the signal strength of each and which one uses the most data. The app will also examine the placement of your Eeros and tell you the best place to position them for the best connection possible. And if there's a network outage, it'll also help you figure out the problem, be it interference or just an issue with the ISP. "If there's a time when you might have to physically do something like unplug a cable modem, it'll walk you through those steps," said Weaver. "We wanted to shed as much light as possible into the network so people can fix issues as they come up on their own." 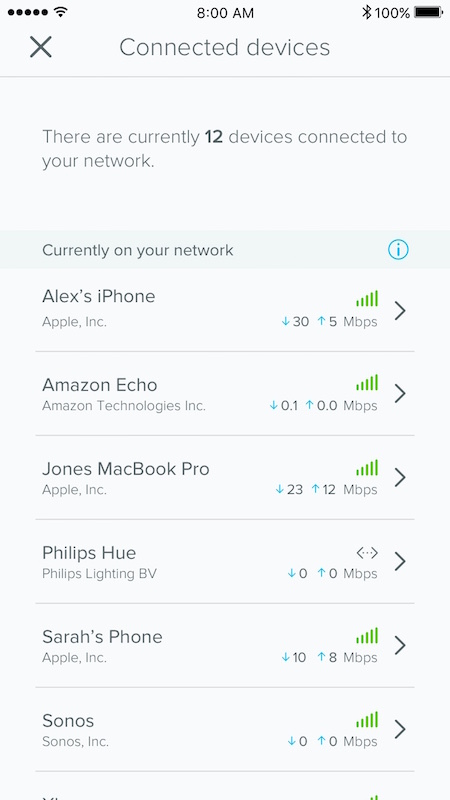 This software update, Weaver said, highlights how Eero separates itself from the pack. "It's basically like getting a free engine upgrade for your car," he said, pointing out that Eero customers are getting a slew of new features just with an over-the-air update. When asked how the Eero compares to other home mesh networking efforts like Google's recent WiFi router, Weaver said that the benefit of Eero is that it's not locked up in one ecosystem. "We want to tap into as many ecosystems as possible," he said, pointing out the Eero's compatibility with the Amazon Echo and possibly more systems in the future. Plus, Eero has already been at it for a year, and thus has a pretty good headstart in understanding the home mesh networking space. This, according to Weaver, allows the company to address and evolve the experience. "We're going to do everything we can to continue to lead this market," he said.